2019.03.09 "목사님, 우리 멍멍이 천국으로 인도 좀 해주세요"
2019.03.03 아마존 열대우림의 포식자 타란툴라의 섬뜩한 모습들 VIDEO: Creepy video captures the world first moment a tarantula the size of a DINNER PLATE devours..
난생 처음 악어 고기를 먹는 심해 동물의 모습을 촬영한 영상이 큰 화제를 낳고 있다. 영상은 미국 루이지애나 대학교 해양 조합 (LUMCON)이 촬영한 것이다. 지난 2월 기증 받은 악어 세 마리의 사체를 멕시코만 해저에 놓아두었다. 수심 2000미터 가량의 심해였다. 등각류라 불리는 갑각류 동물들이 나타났다. 악어 길이는 2~3미터 정도였고 등각류는 럭비공 크기였다. 이 동물들은 악어를 처음 먹어 봤을 텐데 대단히 집요하게 공략했다. 두꺼운 악어 가죽을 뜯어 먹는 것은 기본이었고 일부는 악어 속으로 들어가 파먹으면서 밖으로 나오기도 했다. 해외 네티즌들의 반응은 주로 감탄이다. “이 세상을 살면서 흔히 볼 수 없는 영상”이라며 과학자들의 놀라운 실험 정신에 박수를 보낸다. 불쌍한 강아지 한 마리가 해외 네티즌들의 동정심을 자극하면서 인기를 누렸다. 강아지는 왼쪽 사진에서는 운동화에 코를 박고 있다. 다른 사진에서는 혼절 상태다. 운동화 옆에 누워 있는 강아지는 완전히 기절해버린 것 같다. 사진을 보면 강아지가 운동화 냄새를 맡다가 냄새의 독성 때문에 쓰러진 것 같다. 물론 사실이 아닐 가능성이 높다. 오른쪽 사진의 강아지는 단순히 잠을 자고 있을 뿐이라는 추정이 많다. 그렇다고 해도 해외 네티즌들은 걱정이다. 많은 네티즌들이 강아지에게 신발 냄새만은 피하라고 안타깝게 조언한다. 몇 일전에 일본 시코쿠 에히메현 우와지마시에 첫 벚꽃이 개화한 소식을 전한 바 있다. 상징적 사쿠라 꽃의 등장으로 특징 지어지는 일본에서 봄은 공식적으로 시작되었다. 매년 3월 말부터 5월 초순까지 온 나라가 아름다운 분홍색 꽃으로 뒤덮인 화려한 화려함으로 변신한다. 오사카에서 교토까지 일본 사진작가 고지가 활짝 핀 일본 벚꽃 시즌의 아름다움을 담아내고 있다. Springtime has officially started in Japan, marked by the arrival of the iconic sakura blossom. Every year from late March to early May, the entire country transforms into a colorful splendor, covered in beautiful pink flowers. From Osaka to Kyoto, Japanese photographer Koji captures the beauty of Japan’s cherry blossom season in full bloom. Koji’s stunning photos show streets paved with pink petals, forests blanketed with “sakura snow,” and lines of lush cherry blossom trees. In Kyoto, Koji captures the city’s pastel-pink colored trains rolling through blossom-covered railways. In Osaka, the talented photographer manages to get a shot of a yellow Japanese white-eye bird perched among pink foliage. Thousands of travellers are flocking to the Amazon to chase the highs of the ayahuasca plant. 남미 아마존의 원주민 사이에서 그들의 신화적 세계를 재현시켜 세계관의 통일을 증강시키기 위해서 널리 이용되고 있는 환각제다. "목사님, 우리 멍멍이 천국으로 인도 좀 해주세요"
김모(45) 목사는 최근 신자들 앞에서 고민거리를 털어놨다. "기르던 반려동물이 죽으면 '천국에 가게 해달라'며 추모 예배를 부탁하는 분이 최근 부쩍 늘었습니다. 교회에서 예배를 못 보니 추모식장으로 와달라는 분도 계십니다. 사실 제가 주일 예배와 설교 준비를 하느라 시간도 부족합니다. 상심이 큰 분들께 안 된다는 이야기를 계속 하기도 민망하고…." 김 목사는 "목사는 반려동물 장례식에 참석하지 않기로 교회 규정을 신설하기로 했다"고 말했다. 반려동물을 키우는 사람이 늘면서 자신이 믿는 종교에 따라 동물 장례식을 치르려는 이도 많다. 교리(敎理)상 원칙적으로 동물을 위한 추모 예배나 미사를 허용하지 않는 종교들은 늘어나는 신도들 요구에 난감해하고 있다. 기독교나 천주교에서는 원칙적으로 반려동물은 영혼이 없고, 교인도 아니기 때문에 종교식으로 추모 예배나 미사를 치를 수 없다는 입장이다. 구모(41) 목사는 "교인들의 요청이 많지만 반려동물은 추모 예배를 할 근거가 없다"며 "동물 장례 요청이 들어오면 '가족끼리 조용히 기도하시는 것이 교리에 맞는다'는 식으로 돌려보내고 있다"고 했다. 한국천주교협회 관계자는 "반려동물 장례미사는 '동물은 영혼이 없다'는 천주교 교리상 원칙적으로 있을 수 없는 일"이라며 "요청이 들어오면 단호하게 거절한다"고 했다. 하지만 반려동물을 키우는 신자가 늘면서 일부 목사 사이에서는 "반려동물이 아니라 키우던 사람을 위로해 주는 차원에서 예배를 할 수 있다" "반려동물 문제에 대해 신학적으로 새롭게 해석하는 작업이 필요하다"는 의견도 나온다. 외국에서도 이 문제는 논란거리다. 벨기에에서는 반려견에게 성당 장례미사를 해줄 수 있느냐를 놓고 '종교를 우습게 만드는 행위'라는 의견과 '반려동물도 가족이니 괜찮다'는 의견이 맞선다. 불교계는 늘어나는 반려동물 장례 요청을 수용하고 있다. 서울 강남구 봉은사 관계자는 "3~4년 전부터 반려동물 장례를 치르고 싶다는 요청이 한두 건씩 들어와 점점 건수가 늘어나고 있다"며 "합동 천도재(薦度齋)가 있을 때 신자들이 반려견의 이름을 올리며 제사를 지내도록 해주고 있다"고 했다. 서울 서대문구의 사찰 비로자나국제선원은 '반려동물을 위한 49재'도 열고 있다. 교회나 성당을 대신해 '종교 맞춤형 빈소'를 팔기도 한다. 애견장례업체 '꿈애' 관계자는 "반려견 영정 사진 옆에 십자가, 성모 마리아 상을 두는 맞춤형 빈소를 20만~50만원에 팔고 있다"며 "이용하는 사람이 한 달에 100명이 넘는다"고 했다. 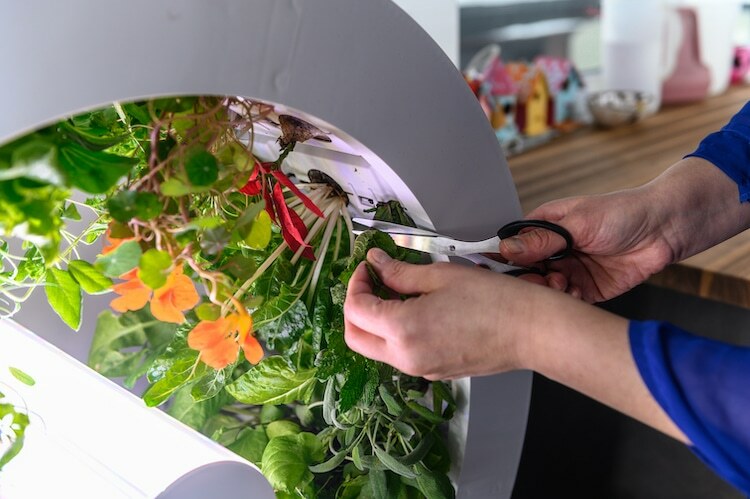 Growing vegetables at home just got easier thanks to OGarden. 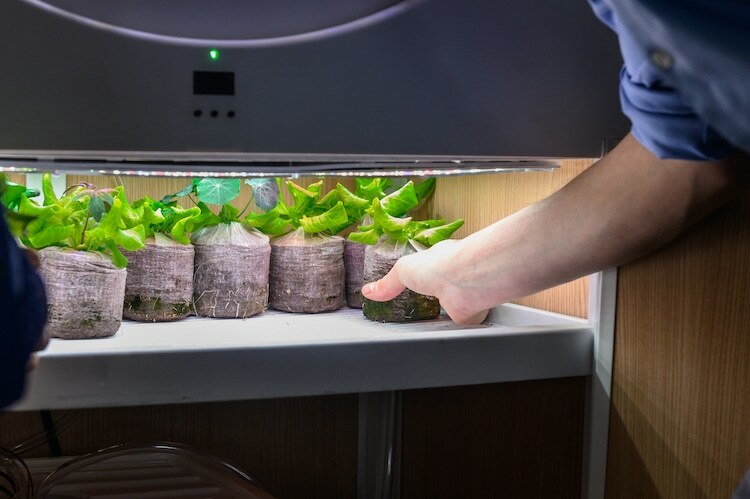 This self-watering indoor garden allows you to grow up to 90 vegetables, fruits, and herbs simultaneously. Fully automatic, you simply plugin, plant, and watch your garden grow. 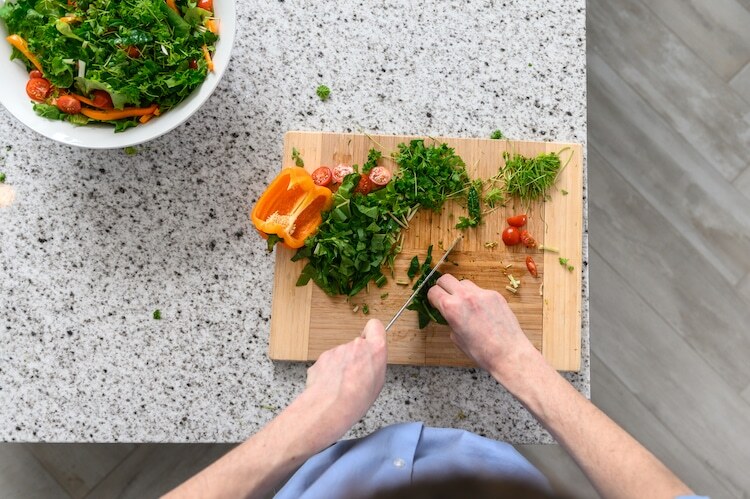 OGarden was launched in 2016 with a successful Kickstarter campaign and is back with the new and improved OGarden Smart, which is available for pre-order through Kickstarter. 집에서 채소를 재배하는 것은 오가든(OGarden) 덕분에 쉬워졌다. 이 자생식 실내정원은 야채와 과일, 약초 등을 동시에 90개까지 재배할 수 있다. 완전히 자동으로, 당신은 간단히 플러그를 꽂고, 식물을 심고, 당신의 정원이 자라는 것을 본다. 오가든은 성공적인 킥스타터 캠페인으로 2016년 출범했으며, 킥스타터를 통해 사전예약 가능한 새롭고 개선된 오가든 스마트로 돌아왔다. 킥스타트 설립자인 피에르 니바트와 피에르 이티엔 본 보겟은 건강한 삶을 유지하기 위한 노력에서 사람들에게 더 많은 권한을 주면서 지구에 긍정적인 영향을 주기 위해 오가든을 만들었다. 업그레이드된 OGarden Smart는 이전 모델의 성공을 기반으로 만들어졌지만 일주일에 한 번만 탱크에 물을 보충하면 된다는 자체 수분 보충 기능을 포함하고 있다. 저소비 LED는 당신의 전기요금을 파괴하지 않고 빛을 시뮬레이션하고, OGarden Smart의 독특한 디자인은 당신이 너무 많은 공간을 차지하지 않고도 자랄 수 있는 식물의 수를 극대화한다. 회전하는 상부 통에 식물을 심을 수 있는 60개의 슬롯과 아래 30개의 식물을 저장할 수 있는 공간이 있으며, 오가든은 일년 내내 채소에 30개의 식물 로테이션이이 가능하다. 페퍼민트, 대파, 딸기, 방울토마토, 케일, 바질 등 다양한 식물을 제공하는 오가든에서 직접 씨앗을 구입할 수 있다. 아니면 목록에 없는 것을 재배하고 싶다면 주문해 직접 씨앗을 심을 수도 있다. 오가든은 심은 지 30~40일이 지나면 수확할 준비가 된다. 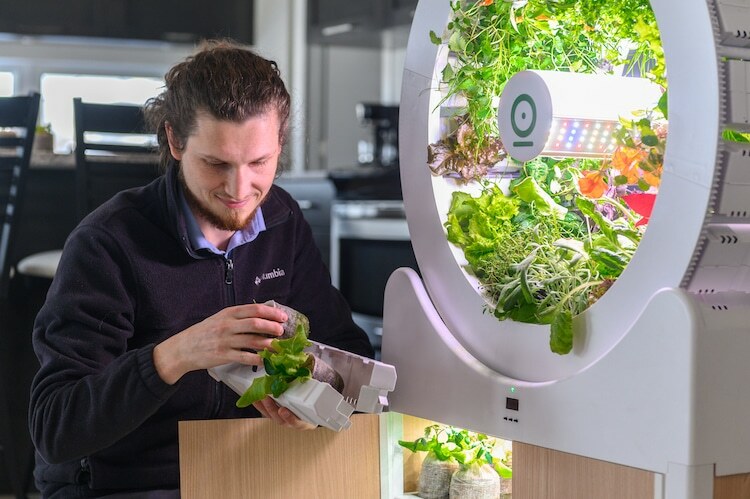 Founders Pierre Nibart and Pierre-Etienne Bourget created OGarden to make a positive impact on the planet while giving people more autonomy in their efforts to maintain a healthy lifestyle. 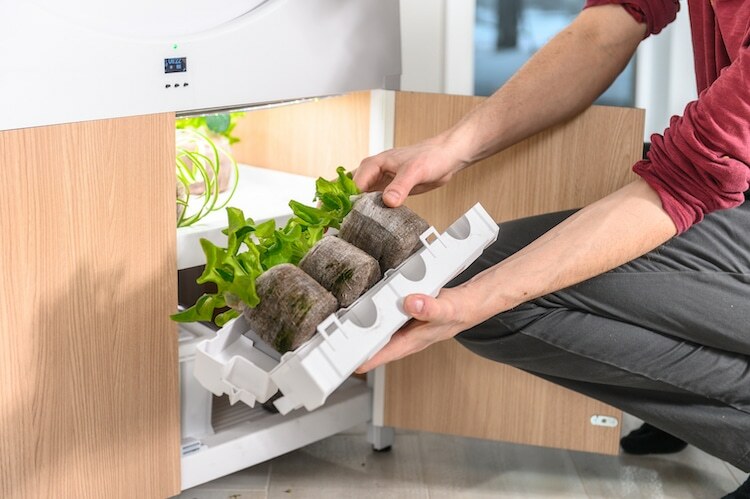 The upgraded OGarden Smart builds upon the success of their previous model, but includes self-watering capabilities that mean you only have to add water to the tank once a week. Low consumption LEDs simulate light without wreaking havoc on your electric bill and OGarden Smart’s unique design maximizes the number of plants you can grow without taking up too much space. 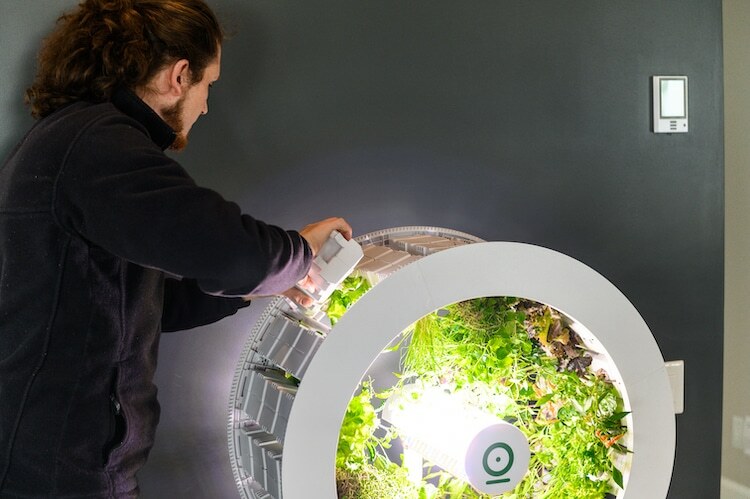 There are 60 slots for plants in the rotating upper barrel and room to store 30 plants below, with OGarden suggesting a 30 plant rotation for year-round vegetables. You can purchase seeds directly from OGarden, which offers a wide variety of plants like peppermint, green onion, strawberries, cherry tomatoes, kale, and basil. Or, if you want to grow something that’s not on the list, you can simply order a bag of virgin earth and plant your own seeds. OGarden estimates that you’ll be ready to harvest 30 to 40 days after planting. With organic vegetables costing a pretty penny, an investment in OGarden means savings long term. 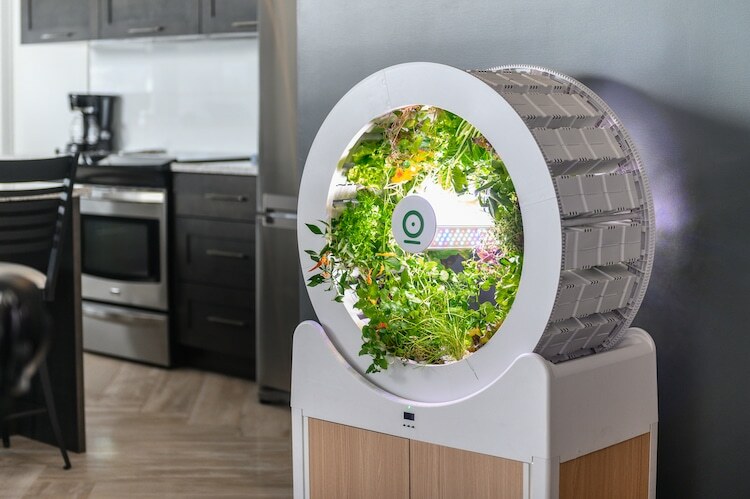 OGarden claims it can save you up to 80% on vegetables, making a nice dent in your grocery bill. For instance, they estimate that store-bought non-organic kale costs an average of $2.50, while the same amount grown organically with OGarden is just $0.45. Another benefit is knowing exactly what’s in your food and keeping it free of pesticides. As OGarden’s soil is made with organic fertilizer, you can rest easy knowing that you and your family aren’t consuming any unwanted substances. The OGarden Smart was fully funded on Kickstarter in just 6 minutes, and is still available for pre-order. For a pledge of $859 Canadian (about $645), you’ll get an OGarden Smart in the color of your choice, as well as 30 seed pods and several different seeds packs. This is a 41% discount off the regular retail price. 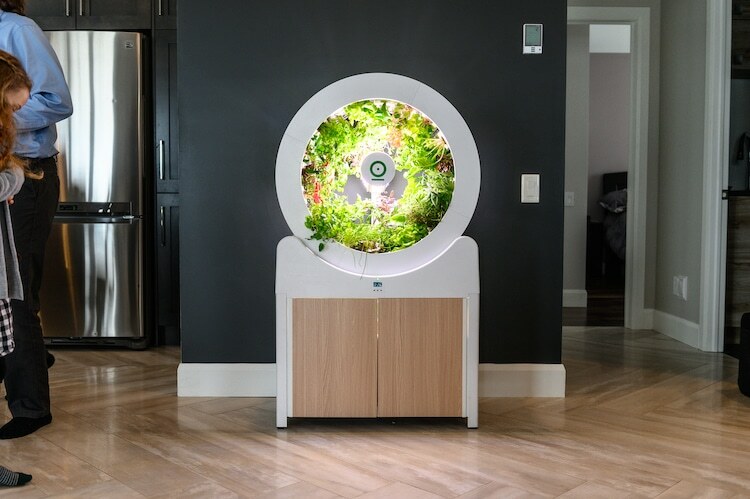 The OGarden Smart is a self-watering indoor garden that can grow 90 fruits, vegetables, and herbs at one time. Seed cups are placed in the nursery cupboard, where they’ll spend 3 weeks sprouting. Then they’re moved to the wheel, where they’ll get the proper amount of light to grow. After 30 to 40 days, the plants can be harvested. And your family can enjoy fresh, organic fruits and veggies at a fraction of the cost. 아마존 열대우림의 포식자 타란툴라의 섬뜩한 모습들 VIDEO: Creepy video captures the world first moment a tarantula the size of a DINNER PLATE devours..
이 조사 현상은 지구상에서 가장 다양한 생태계 중 하나인 안데스 근처의 저지대 아마존 열대우림에 위치해 있다. 이 지역에서 파충류를 연구하는 연구원들에 의해 그 흔적들이 카메라에 잡혔다. 포식자들이 스스로 몸부림치는 모습은 연구의 부산물로 나타난다. 거미의 사냥능력에 대한 15가지 '희귀하고 무서운' 예로는 숲 바닥을 가로질러 다니는 타란툴라의 섬뜩한 이미지가 있다. 다른 사진에는 사람을 죽일 수 있는 뱀을 먹는 지네들도 포함되어 있다. Amphibian and Rptile Conservation 잡지에 의해 온라인에 게재된 이 연구팀의 연구결과는 다양한 동물에 대한 포식자들을 자세히 묘사하고 있다. 미시간 대학의 진화 생물학자인 다니엘 라보스키(Daniel Rabosky) 박사는 '이것은 척추동물들 사이에서 그동안 인지되지 않았던 사망 원인이다. '아마존에서 작은 척추동물의 놀라운 사망은 큰 거미와 지네 같은 절지동물 때문일 것이다라고 말했다. 라보스키 박사는 페루 남동부의 외딴 마드레 드 디오스 지역에 있는 로스 아미고스 생물역 탐사를 위해 한 달간 연구팀을 정기적으로 이끌고 있다. 이 연구 장소는 지구상에서 가장 다양한 생태계 중 하나인 안데스 구릉지대 근처의 저지대 아마존 열대우림에 위치해 있으며 이 팀의 주요 연구 초점은 파충류와 양서류의 생태학이다. 포식자들이 몸부림치는 모습들은 연구의 부산물로 나타난다. Nature's brutality has been captured on camera by biologists who filmed spiders devouring frogs, lizards and even opossums in the Amazon rainforest. Fifteen examples of the hunting prowess of animals is displayed in gruesome images, including a tarantula the size of a dinner plate dragging an opossum across the forest floor. Other footage includes centipedes eating snakes that are capable of killing humans. The team's findings, published online by the journal Amphibian and Reptile Conservation, detail predators preying on a range of different animals. Dr Daniel Rabosky, an evolutionary biologist at the University of Michigan, said: 'This is an underappreciated source of mortality among vertebrates. Dr Rabosky regularly leads a team of researchers on a month-long expedition to the Los Amigos Biological Station in the remote Madre de Dios region of south eastern Peru. The study site is located in lowland Amazon rainforest near the Andes foothills, one of the most diverse ecosystems on the planet. The team's main research focus is the ecology of reptiles and amphibians. Images of predators gorging themselves comes as a by-product of the research. 일본산 비단잉어가 세계 부호들의 사랑을 한 몸에 받고 있다. 일본 곳곳에서 열리는 여러 비단잉어 품평회에는 외국인 부호들이 몰리고 있고, 지난해 열린 비단잉어 경매에서는 한 중국인 부호가 사상 최고가인 2억3000만엔(약 23억원)에 낙찰받았다. 니혼게이자이 신문에 따르면 흰 바탕에 붉은 무늬가 선명한 이 비단잉어는 이달 초 도쿄에서 열린 '전일본비단잉어종합품평회'에서도 1위를 차지했다. 나카지마 마사아키(中島正章) 전일본비단잉어애호협회 회장은 "세계에 이런 모양의 비단잉어는 단 한 마리밖에 없다는 게 매력"이라고 설명했다. 200년 전 에도(江戶) 시대부터 관상어로 인기를 얻은 일본 비단잉어는 "헤엄치는 보석" 또는 "헤엄치는 예술품"으로 불린다. 식용으로 사용하던 보통잉어에 갑자기 몸에 무늬가 생긴 변종으로 몇 대에 걸쳐 교배를 거치며 개량을 거듭했다. 처음에는 관상어로 큰 주목을 받지 못했지만, 점점 외관이 아름다워지면서 일본인 뿐 아니라 세계인의 눈을 사로잡았다. 지난해 11월 비단잉어의 본고장인 니가타(新潟)현 오지야(小千谷)시에서 열린 품평회에도 참가자의 절반 정도가 외국인이었다. 품평회에 참가한 한 중국 부동산회사 사장은 "비단잉어가 우아하게 헤엄치는 모습을 보고 있으면 일상의 스트레스를 잊는다"면서 "몇시간을 보아도 질리지 않는다"고 말했다. 니혼게이자이 신문은 최근 아시아와 호주 등 세계 각지에서 품평회가 열리고 있지만 애호가 사이에서는 "본고장인 일본에서 수상하는게 지위와 신분의 상징"이라며 일본산 비단잉어에 높은 점수를 줬다고 보도했다. 일본산 비단잉어의 인기는 경매 가격도 높이고 있다. 수천만 엔(수억 원) 정도에 낙찰되던 일본산 비단잉어는 외국 부호들의 경매 참여가 늘면서 낙찰 가격이 천정부지로 높아지는 추세다. 지난해 경매에서 한 중국인 부호는 히로시마현의 한 양어장에서 길러진 비단잉어를 사상 최고가인 약 23억원에 사갔다. 일본산 비단잉어 수출은 지난 5년간 35%나 증가했다. 특히 2017년 수출액은 36억3300만엔(363억3000만 원)으로 10년만에 배로 늘었다. 수출 상위지역은 홍콩·네덜란드·독일 등이며 최근에는 브라질과 아랍에미리트(UAE) 두바이로의 수출도 늘고 있다. 비단잉어 업계는 앞으로도 수출이 더 늘어날 것으로 보고 수출 증진 노력을 강화한다는 계획이다. 나카지마 회장은 인기가 높아져 치어가격도 올라가는 바람에 "정작 일본 애호가들은 손에 넣기 어렵게 된게 좀 안타깝다"고 말했다.